What do you know about Greek grain goddesses? Okay, stop running away from me. Even if you don’t care, you should, because old stuff. And you probably at least know about the story of Demeter, the goddess of grains and the harvest, who accidentally created the seasons — and, in doing so, Seasonal Affective Disorder — when her daughter Persephone had to spend part of the year hanging out in Hades. Sad, lonely grain goddess = dead plants. Grain goddess rejoined with daughter = springtime. This apparently was enough to quiet inquisitive ancient Greeks. So yeah, Demeter’s the main plant lady and certainly the most important, with Persephone being runner-up, mostly because she’s pretty well-known and is sometimes depicted as holding a sheaf of grain. (Carrying stuff is the ancient Greek way of signifying a personality, kind of like how weather a leather jacket is in modern society.) But just as many major gods are flanked by supporting B- and C-string deities, Demeter has a little sidekick grain goddessette who is far less famous. Let’s say she’s the goddess depicted below, her status being ably signified by the grain she’s clutching. Now, if she’s a less powerful and more narrowly specialized goddess whose powers extend only to grain and seeds, what might a good name be for her? 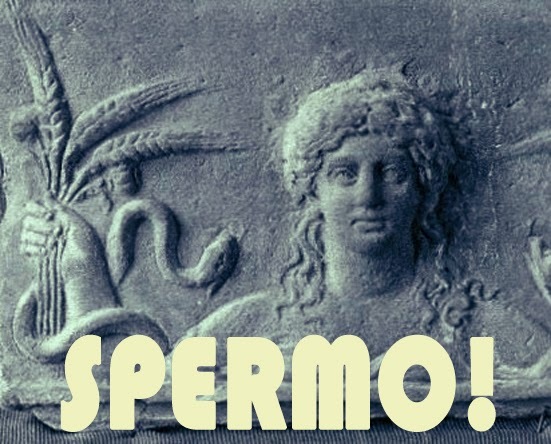 As far as names go, Spermo totally got the shaft, so to speak, even though the etymology of her name — from the Greek sperma, “seed” — makes sense in terms of her family’s longstanding affiliation with agriculture. Spermo, you see, is one of the Oenotropae, a trio of sisters who each reign over a specific agricultural product — Spermo over grain, Oeno over wine and Elais over oil (the kind used in food, not the kind used as fuel). The group name Oenotropae translates as “the women who change wine,” so both Spermo and Elais have a reason to feel inferior, I guess. Spermo more so, clearly. The reason wine in particular gets emphasized with these three is that their father, Anius, is the son of Apollo and Rhoeo, who is in turn the daughter of the wine-affiliated Staphylus, who I mentioned in yesterday’s post. Therefore, Spermo is the great-granddaughter of the wine god Dionysus, whose small-dickedness was the focus of Sunday’s post. I guess that makes for a fun little trio of posts on this family and its quirks. According to some sources, Spermo and her sisters are not goddesses but just human women with magic powers — specifically to turn anything they want into the agricultural item they’re associated with. (Not such a gift, that that transformative touch. Didn’t they ever hear about King Midas? Or Patrick Skene Catling’s 1952 children’s novel The Chocolate Touch?) In one version of their story, they are captured by the Greeks en route to the Trojan War so they can provide food for the troops, but Dionysus transforms the sisters into doves so they can escape. Also: Of freaking course they get turned into doves. Sometimes I wish I was a character in Greek mythology so I could get turned into an animal, but I’d probably just get decapitated in a war or something. Family lineage and transformation into birds aside, you have to admit: Her name Spermo, and that’s pretty awesome. Wait, because she was gross or because her family was traditionally Greek and she was really unfortunate. I hope it's the latter, because I really want there to be someone, somewhere, with a Great Aunt Spermo or something like that. Man, I studied Greek-Latin Mythology in my first year in Uni and no one told us about this lady. Pretty amazing name.